In 1993, I visited for the first time the Colca Canyon, tucked away in the Andes Mountains, a few hours drive from Arequipa, Peru. I was accompanied by a local colleague and a driver. To add a measure of interest to the trip, we decided not to backtrack from "El Mirador del Condor" (The Viewpoint of the Condor) to Arequipa, but rather to keep driving forward to meet the Panamerican Highway, essentially, making what amounted to an 18-hour circuit over little-traveled gravel roads. Along the way, we were regaled with magnificient scenery and the familiar rural landscapes of the Peruvian Andes. Many people assume business as usual as they venture into these areas, without realizing that there are deep cultural differences. Upon reaching the town of Huambo, I had an urge to go to the bathroom, so I instructed our driver to stop at a suitable place. He stopped at a corner store, I jumped out of the car, entered the store, and said to the salesperson, almost pleading: "May I use your bathroom?" She looked at me, half surprised, half nonchalant, and said: "We do not have that here." When I politely insisted on an explanation, she motioned to the outside, and said in a slow tone, so that she was sure that I got the message: "When people want to go, they manage somehow." It was a lesson in rural Peru that I would never forget. 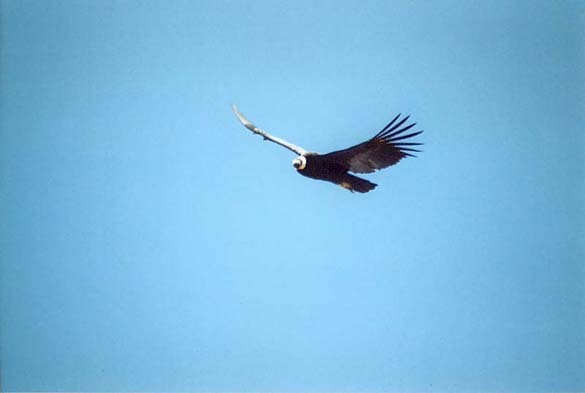 One of the condors that 600 tourists hope to see in the Colca Canyon every day.